I love soup. I love broths, creamy soups, chunky soups, bisque, and chowder. I love them in a bowl, a cup, a jar or right out of the pot its cooking in. It doesn’t matter if they are carefully constructed or a beautiful mish mash of foodstuffs on the verge of becoming compost, salvaged from the refrigerator. Some can be made quickly or even at the speed of light if you use your Vitamix. Then there are those that require time. Time to simmer and bubble to let the vegetables get tender and the flavours to meld. Tick, tock. Tick, tock. Come on already! This lady has things to do, places to be, people to see. Which means as much as I love to spend time in the kitchen creating and testing recipes there are times when I don’t have time. So imagine my delight when a Canadian dude by the name of Robert Wang invented my beloved Instant Pot a.k.a. the greatest small kitchen appliance ever known to woman. A carefully engineered stainless steel wonder that lets me make soup in under 40 minutes. The same soup that normally takes anywhere from four to ten hours to cook. I know, I thought it was some kind of witchcraft too the first time it happened. But it keeps happening over and over again so there is no denying that this one little gadget can literally change the way you cook. For the better. Even my husband has taken to using it and has now put my Instant Pot Chili which has gone from a 3 hours to in my bowl in less than one, on a bi-weekly rotation. I realize that not everyone has one yet but if I (and the inventor who’s mission statement is “an Instant Pot in every kitchen”) have anything to do with it, they will. If you need any more convincing (is that possible) take a look at this recipe for a long time favourite of many which I have updated to include another Instant Pot favourite, Kalua Pig instead of the usual leftover ham. 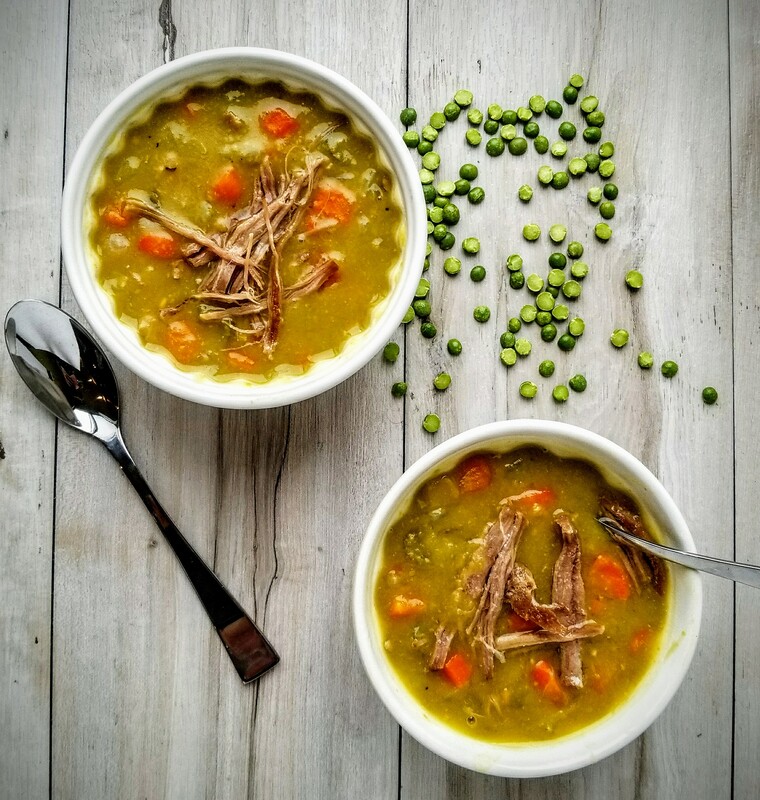 This is one of those stick to your ribs kind of soups that will keep you feeling full for hours and warm you up from the inside out. Turn your Instant Pot on and press the Saute button. Add the avocado oil and heat. Add the chopped onions to the oil and stir to cook until soft, about 2 minutes. While the onion is cooking, chop the celery and carrots. Add to the pot with onion and cook for 3 minutes, stirring occasionally. Push the Cancel button on the Instant Pot. Add peas, chicken broth, water, bay leaf and salt and pepper. Push the manual button. Set the cooker on “High” and adjust time for 17 minutes. Grab a cup of tea, that book you’ve been wanting to read and relax for the next 30 minutes. Once the Instant Pot is finished cooking, push the Manual/Cancel button to shut it off. At this point you can either wait for the IP to release pressure naturally or if you just can’t wait, give it five minutes and then manually release the pressure. Take the lid off, throw in your Kalua Pork or ham, stir, replace the lid and let stand for 5 minutes.